Single bell 17-1-20 18-0-27 17-2-6 47" F 1913 John Taylor & Co. Never Hung for ringing. Scrapped 1975. Cast weight 18-0-27. Exactly half way between E and F.
1360 - 1380 Bell cast by Stephen Norton (future 4th of 5) for Holy Cross, Canterbury. 1608 Treble and tenor (of 4) recast by Joseph Hatch at Holy Cross, Canterbury. 1615 2nd (of 4) recast by Joseph Hatch at Holy Cross, Canterbury. 1739 Treble added by Thomas Lester to make 5 at Holy Cross, Canterbury. 1883 Tower built by C. N. Beazley between 1883 and 1884. 1884 Single bell cast and hung by Gillett & Co. in the new tower. Church consecrated and parish formed from Acol, Birchington, Minster and Margate (St James). 1913 The Gillett bell was removed and a new bell by John Taylor & Co. was hung for ringing in a composite wood and cast iron frame. 1972 May The 5 bells from Holy Cross Canterbury were removed by Association members and stored at Whitechapel under license from the Diocese. 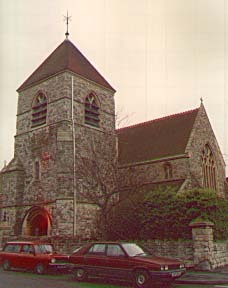 1975 The 5 bells from Holy Cross, Canterbury were tuned and transferred here and hung with a new treble to make 6 in a new frame by Whitechapel (using metal from a bell from Wellington School). Dedicated in July by the Archdeacon of Canterbury.